WHEN: Opens Saturday, March 12th with an opening reception, 5pm – 10pm. Exhibition runs until April 28th. 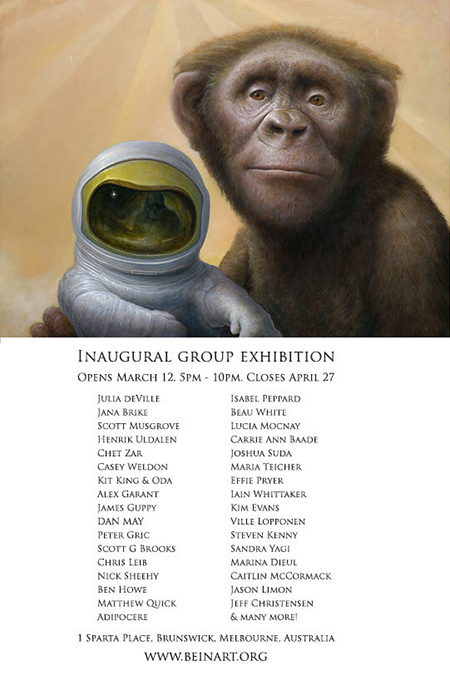 PARTICIPATING ARTISTS: Julia deVille, Jana Brike, Scott Musgrove, Chet Zar, Casey Weldon, Henrik Aarrestad Uldalen, Dan May, Kit King, Oda, Alex Garant, James Guppy, Matthew Quick, Peter Gric, Scott G Brooks, Chris Leib, Caitlin McCormack, Nick Sheehy, Steven Kenny, Adipocere, Amanda Sage, Lucy Hardie, Rachel Bess, Ben Howe, Carrie Ann Baade, Sandra Yagi, Lucia Mocnay, Joshua Suda, Maria Teicher, Effie Pryer, Tim Molloy, Beau White, Iain Whittaker, Kim Evans, Ville Lopponen, Marina Dieul, Jason Limon, Isabel Peppard, Dale Keogh, Jeff Christensen, Orryelle Defenestrate Bascule, Gerard Geer, Larkin, Macsorro & more!